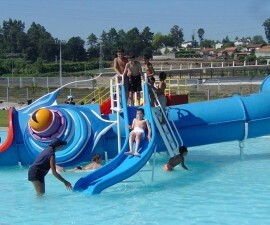 Inaugurated in the summer of 2011, Naturwaterpark is the first completed phase of a large-scale amusement park complex located in Vila Real, within easy reach of Oporto on the North East coast of Portugal. The park is designed to cater for your every need ensuring you are fully entertained from the moment you enter until the gates close at night. Since it opened in August it has proved to be a big hit with tourists and locals alike. 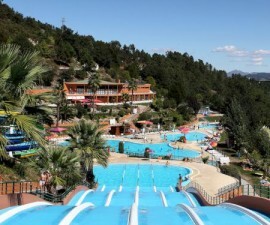 Naturwaterpark boasts a total of 8 slides, delivering an adrenalin boost for even the most adventurous. Pit your wits against the Kamikaze and hurling yourself down the Hidrotube and you´ll be left clamouring for more. Ski Fast will also test your bravery and if that´s not enough head for the Ramp, Ball Slide and Mini Toboggan to finish up before taking some time out to relax and recharge your energies. Enjoy some down time with a float in the Jacuzzi whirlpool or simply chill in Relax Lake, an oasis of peace and tranquillity punctuated only by the sounds of the giant waterfall. For younger guests the dedicated children´s area is feast of fun and adventure, with something to explore in every corner. Here they can wander through a fantasy landscape of plants, rocks, streams and bridges whilst navigating their way under water cannons, down slides and through tunnels whilst encountering whole host of unexpected discoveries. 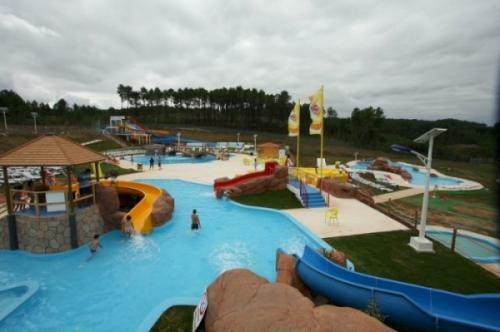 Naturwaterpark´s facilities are all you would expect of a brand-new complex. There is a large car park with ample parking, excellent disabled access, hot and cold showers, towel and parasol rental and food and drink for all tastes and budgets. Guests can choose to relax over a meal in the park´s spacious air-conditioned restaurant, eat a snack at the poolside snack bar or simply enjoy an ice-cold drink on a sun lounger in the shade whilst savouring the sights and sounds of the park. 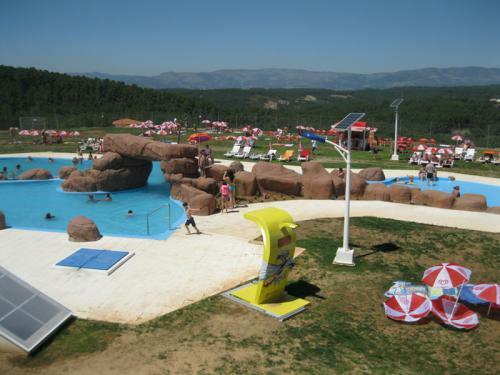 The park is Portugal´s first ecological amusement park and promises big things in both eco-technology and leisure. Linked with the water park is a huge adventure park offering mini golf, climbing, tennis, cycling and football facilities. Coming soon are paintball, mountain bike tours, horseback riding and target shooting. And if you can´t bring yourself to leave at the end of your day, simply check into the camping park to ensure you are on-site bright and early to enjoy another day of sheer pleasure at Naturwaterpark.